But how do we go from a fast-paced, eat what is in front of you, lifestyle to one that incorporates mindful eating into each eating event? 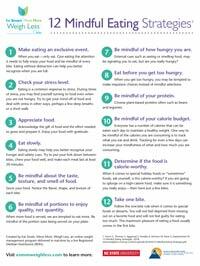 Our team is here to help with 12 Steps to Mindful Eating. Incorporating these steps to mindful eating into your life can have transformative results. Give it a try – you’ll be glad you did. Ready to start eating mindfully? Download our free 12 Steps to Mindful Eating to get started.